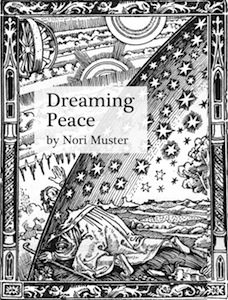 Click book cover to read more about Dreaming Peace, by Nori Muster. This is a chronological list of authors who write about the concept that thoughts create reality. There are literally thousands of books and teachers of this science. Carl Jung called it alchemy, others called it secret, or ancient wisdom; some say it is religion, while others call it psychology. The authors are listed by the date of their first (or best known) book. Many are linked to their web site or to Amazon.com. People ask me what my favorite positive thinking books are, like, what books do I live by? I'll tell you up front so you don't have to guess from this list of thousands of books! First, I love Ernest Holmes (all his books) and Maxwell Maltz, author of Psycho-cybernetics. Ernest Holmes said thoughts are things, and they are. Maltz said that you can let go of your mistakes and focus your subconscious mind on positive thoughts, feelings, and goals. One of my favorite contemporary authors is James Redfield. His stories are in the tradition of Og Mandino (1923-1996), who published The Greatest Salesman in the World in 1968. Redfield's Celestine Prophecy series has a good message for the world. Life is about love. Learn to live a good life, fight corruption, and help the world get through the paradigm shift. There are many more great authors - this page represents my research during the years I was writing my positive thinking book. The timeline is arranged by decade, so scroll to the top and scroll to the right. Ralph Waldo Emerson (1803-1882) On Self-Reliance (1841), his essay "Experience," Emerson sets down the basis of the new age philosophy that we see what we think we see, and our vision is the world where we live. 1824 Emma Curtis Hopkins, High Mysticism 19th Century new thought movement. George Eliot (Mary Ann Evans) (1819-1880). 1910s Charles Baudouin - Suggestion and Autosuggestion. 1922 Emile Coué (1857 - 1926) My Method (1922). Coue was a pharmacist in France who noticed that people could heal without drugs if they believed they could. Self-Mastry Through Conscious Autosuggestion (1922). H.G. Wells was acclaimed during his lifetime as one of the most original and creative thinkers of the 20th century, and retains to this day a position of considerable importance in the history of ideas. In 1928 when he wrote this cry for a new age of worldwide knowledge networking, there was no Internet. Yet Wells was already convinced that if only thinking people across the planet could somehow pull together and pool their expertise, energy, and insights into sort of "cerebrum for humanity," then the world would be a saner, safer, better, fairer place. Anyone aware of how the Internet already reflects both the vices and the virtues of society and wonders how a world-renowned visionary like H.G. Wells envisaged knowledge networking as working in practice will enjoy this book. It is a hymn to the practical possibilities of world group action. W. WARREN WAGAR is the Distinguished Teaching Professor of History at Binghamton University, and a Vice President of the H.G. Wells Society. He is the author of several books on Wells. 1930 Fulton J. Sheen - Catholic Auxiliary Bishop of New York (1895-1979) Your Life Is Worth Living (1965) First radio show: "The Catholic Hour" (1930-1950); first television show: "Life Is Worth Living" (1951-1957); final TV show: "The Fulton Sheen Program" (1961-1968) He denounced Communisim and produced inspirational materials. Urban Legend he predicted the death of Joseph Stalin. Simple Truths: Thinking Life Through With Fulton J. Sheen. 1934 Emmet Fox (1886-1951) - Unity Church - Find and Use Your Inner Power (1934?) . . . Unity Church (1886-1951) Power Through Constructive Thinking (1940). 1936 Dale Carnegie (1888-1955) How to Win Friends and Influence People (1936), How to Stop Worrying and Start Living (19?? ), How to Develop Self-Confidence and Influence People by Public Speaking; Dale Carnegie & Associates, Inc.
1952 Norman Vincent Peale (1898-1993) The Power of Positive Thinking (1952); Six Attitudes for Winners 1989; You Can if You Think You Can; The Amazing Results of Positive Thinking (1959), and many others. Peale was a Christian minister. Peale's work continues under The Peale Center for Christian Living and Guideposts Magazine. 1959 David J. Schwartz, Ph.D., University of Georgia The Magic of Thinking Big (1959), The Magic of Thinking Success (1987) Business man who shares his secrets to success. Dr. Robert H. Schuller (1926 - ) founder of the Crystal Cathedral in Anaheim/Garden Grove - followed Norman Vincent Peale; both were trained and ordained in the Dutch Reformed protestant sect, and successfully combined positive thinking with Bible teachings. 1960 W. Clement Stone Success through a Positive Mental Attitude co-author (1960), The Success System That Never Fails (1962), Believe and Achieve (audio series). Successful businessman, a follower of Napolen Hill, who also wrote a book with Hill. 1962 Catherine Ponder - Unity Church - The Dynamic Laws of Prosperity: Forces That Bring Riches To You (1962). 1968 Augustine "Og" Mandino (1923-1996) The Greatest Salesman in the World (1968) other books: The Christ Commission, The Greatest Secret in the World, The Greatest Miracle in the World (1988), Success University, The Choice. A multi-millionaire who was penniless before reading Think and Grow Rich. He wrote several best sellers that are fictional stories with a message about prosperity. 1981 Eileen Caddy (1917-2006), God Spoke to Me co-founder of Findhorn Foundation. 1998 Spencer Johnson Who Moved My Cheese? ManfredConfidence.com A site for positive thinking professionals and students. bnPublishing.com eBay shop that sells positive thinking materials. Executive Excellence Press - Personal Excellence and Executive Excellence books, tapes, CD-ROMs, custom editions, reprints, etc. Affirm Ware Software has the tools to chisel away limiting beliefs and sculpt the future you dream of. Index of positive thinking autors at Win-WinResourceCenter.com:John Abdo, Jay Abraham, Lou Adler, Tony Alessandra, Robert G. Allen, Howard Berg, Ken Blanchard , Les Brown, Jack Canfield, Richard Carlson, Deepak Chopra, Stephen Covey, John Cummutu, Roger Dawson, Bert Decker, Larry Dossey, Wayne Dyer, Gerald Epstein , Neil Fiore, PhD, Scott Flansburg, Ed Foreman, Michael Gelb, Michael E. Gerber, Seth Godin, Nick Hall, Ph.D., Mark Victor Hansen, Napoleon Hill, Tom Hopkins, Kerry L. Johnson , Dan Kennedy, Robert Kiyosaki, Jay Conrad Levinson, Alec Mackenzie, Mel Mackenzie Brown, Harvey Mackay, Thomas J. Leonard, Howard Martin, Dalton McCrary, Dan Millman, Peter Montoya , Earl Nightingale , Chris Northrup, Gary Null, Paul Pearsall Ph.D., Lee Pulos, Ph.D, Anthony "Tony" Robbins, Jim Rohn, Colin Rose, Bill Staton , Elaine St. James, Robert Stuberg, Peter Thomson , Brian Tracy, Kevin Trudeau, Dr. Kenneth Ruge, Dr. Richard Shoup, Denis Waitley, Jim Warner, James Waldroop, Zig Ziglar.